We are looking for a professional, aggressive, self-motivated sales professional to help develop and expand our existing roll-off dumpster rental and waste services business throughout Baltimore, Metropolitan Maryland and the District of Columbia. A qualified candidate must have a proven sales track record and a minimum of 5 years of commercial or business to business sales experience in a construction related field. The person must possess good verbal and written communication skills to effectively interact with customers and our employees. We offer an attractive compensation package, including a base salary and commissions on results achieved. Additionally, we offer a comprehensive benefits program which includes medical, dental, vision and matching 401k. Diamond Waste Services, Inc. is an Equal Opportunity Employer. 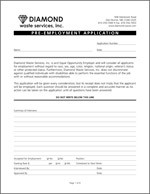 Please email your resume to: wally@diamond-waste.com or mail to Wallace Putkowski at the office address listed below. We are currently looking for experienced roll-off drivers. Please apply in person at our office. Bring your current driving record, driver’s license and D.O.T. physical card. Competitive compensation package and full benefits. Diamond Waste Services, Inc. is an Equal Opportunity Employer. For more information please e-mail: RayK@diamond-waste.com. Use the above Google Maps link or click here for our driving directions page, or click here to download a PDF copy of driving directions.